Sunday Quote: Aliens and Paganism? | J.W. Wartick -"Always Have a Reason"
Sunday Quote: Aliens and Paganism? 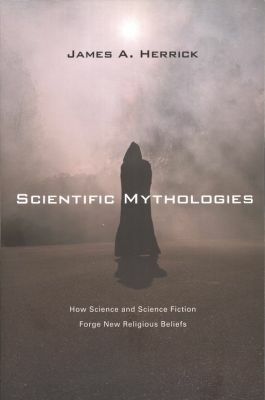 Have you witnessed any kind of “new mythologies” being followed or created through science or science fiction? I think that sci-fi is a great way to convey a worldview, and I’ve commented often on various ways people have used it for just that purpose. What ways might new scientific mythologies shape our perceptions of ourselves and others? Do you think Herrick’s point is to be well taken, or is he wrong? Why/not? I encourage you to check out the fascinating book. Thanks to my friend Josh over at No Apologies Allowed for so long ago introducing me to it. Materialists: Where is hope? Look to the stars!– I analyze one aspect of materialism: the way that some look to hope in the “beyond” of the outer limits of the universe. Hope, for materialists, may come from the stars. Our salvation may lay beyond our solar system, in benevolent aliens who will bring great change and advances to us. James Herrick, Scientific Mythologies: How Science and Science Fiction Forge New Religious Beliefs (Downers Grove, IL: IVP Academic, 2008). « Really Recommended Posts 9/19/14- Aquinas, the “Gospel” of Barnabas, Poverty, and More! I am always leery of words like ‘myth’ that contain two very distinct and (almost) contrary meanings. In this case, ‘myth’ can be used as a fiction (or even a lie) as well as particular kind of narrative intended to convey a deep human truth. So when I see the phrase ‘new mythology’ I suspect there is confusion and conflation. From my own studies of mythology, I very much lean towards myth as a fictional form of narrative used to explore timeless human themes… as true today (and personally applicable) as whenever they were written. As such, myths are probably the finest of all teaching tools. After all, the symbolic language used in myths to personify these human themes is the same as our dream language. This is the way our brains represent issues in our own lives and allow us to consider them (symbolic representations). Just as in our dreams, we know that narratives that contain supernatural abilities and events are the signposts for these deeper thematic representations. When we dream of flying, for example, we don’t awake and presume we can fly anymore than we should presume a talking snake is a literal and historical creature; we know that the dream flying is a symbolic representation of a powerful feeling awakened by some issue (and the emotions attached to them in one’s personal non-dream life. We should equivalently know that a narrative involving, say, a talking snake is a signpost for a symbolic representation that includes some of the properties best represented by a real snake (such as closest to the ground). In one sense, science fiction is a symbolic representation of science itself: narratives that explore common human themes in response to increasing sophistication of knowledge about the universe. Think of the worlds of Star Trek and Star Wars, for example and why we tend to respond so powerfully to their exploration of the human condition. I know, JW, that you are fan of Star Trek and appreciate how human issues are explored this way. That is myth in action but only it’s narrative form is different than, say, the 14th century myth of the Green Knight or the ancient myths of the Greek or Norwegian pantheon of gods (both of which make more than just appearances in the Star Trek universe… the Klingons, for example, use a copy for their ‘cultural’ history! The mythology is effective because we understand the symbolism and can apply it with effect to ourselves in our non science-fiction lives and have a better understanding of what it is to be human from these fictional narratives. Any ‘new’ mythology is really the same mythology in some new form, in the same way a romance novel is the same story about the same human concerns no matter in what century and setting the narrative is placed. Swords and sorcery fiction is the same story in Greek anthology as it is in the Star Wars universe with the same themes represented by princesses in need of rescuing and Dark Lords to overthrow who entrap them. The struggle each of us undergoes in our lives cannot help but be of a similar kind dealing with exactly these same themes. And that’s why mythology itself is a timeless teaching tool. And if there be any doubt about the power and effectiveness of this teaching tool and our biological response of attention to it (regardless of form), go gather a group of children and start to tell them a story. The mythology is effective because we understand the symbolism and can apply it with effect to ourselves in our non science-fiction lives and have a better understanding of what it is to be human from these fictional narratives. But the Bible couldn’t possibly do this because it has at least one bad part, right? On a less antagonistic note, is the truth or falsity of the myth 100% irrelevant to its being effective, especially over the long-term? I can see a good deal of disconnect, but 100% disconnect? I’m not convinced of that. It seems there are rules as to which myths work and which are useless. P.S. Given what you wrote here, you might like James Hillman’s Healing Fiction, and perhaps Donald E. Polkinghorne’s Narrative Knowing and the Human Sciences. Hillman sometimes gets a little into Jungian terminology, but even if 10% of what he says is insightful, that might be better than most of the stuff out there. I know I’m probably going to regret this, but you so often insinuate stuff to promote a negative misrepresentation of my comments and their motives, as if because of my disdain for Christianity this disdain must automatically mean that the Genesis creation myth couldn’t possibly be such a teaching tool. That’s a misrepresentation. For example, I say that I think myths are the finest of all teaching tools. Genesis is just such a myth. As an aside, it is a conflation of two only slightly different creation myths… but the differences are telling and interesting in their own right. The first is the original (because of its age) and the second a conflation. The second seems to me to be more of a Jewish version built I think on the former presumably to use as a unifying theme for partitioned tribes, as if to suggest all Jews are really one people because they all started from the same point – the people chosen by YHWY. But that’s neither here not there for my point. My point is that this creation myth IS a valuable teaching tool in its own right. Knowing absolutely nothing about some later religion like Christianity, we know that the Genesis creation myth and the wisdom of its personal meaning should be accessible to all and able to stand on its own merit. Please consider this point carefully: a myth has to stand on its own merit and not be dependent on a particular interpretation, a particular culture, a particular language, a particular religion. The Genesis myth is no different. It stands on its own merit. For more than a thousand years, the myth was used as a teaching tool… long before it was used by the Jews and later by the Christians. The myth stood then – as it does now – on its own merit. Well, we should be able to read the myth regardless of our cultural and religious baggage and still be taught something (actually, teach ourselves) about what it means to be human. This is the value of myth. Now along comes the Christian who decides to read the Genesis myth not as it is but as an explanation of a later (supposedly) historical event. In any regulated mythology class, this approach would yield an automatic ‘F’ grade. You can’t read myths this way and still have a myth. Myths have to stand on their own merit an not be dependent on imported meaning for the symbols. The symbolic representations have to be accessible to everyone based on understanding from everyday life. The Christian interpretation doesn’t allow for this. It loads up the myth with – I’m trying to think of a strong enough word and have to settle for – ludicrous meanings relevant only to this later (supposedly) historical event so that the myth can be manipulated to ‘teach about’ (aka ‘deliver’) only one thing: the need for a very specific kind of redemption that just so happens to be the later (supposedly) historical event! My, what a coincidence… not. If someone attempted to interpret the myth of Star Wars by means of, say, Steve Jobs and why Apple products are necessary for happiness, we would soon find the myth hopelessly muddled by an interpretation reliant on meanings unrelated to the myth itself but IMPORTED to it. The myth would become a narrative about Apple and loses its mythological properties (and wisdom) in the undertaking about us… the audience. The Genesis myth loses it properties to teach about what it means to be human when the Christian relies on Christian symbolic meaning IMPORTED into the narrative before attempting to ‘interpret’ it! The myth becomes a narrative about Jesus-the-redeemer and loses its properties (and wisdom) in the undertaking about us – the audience. This importing of biased meaning into myths is a guaranteed way to alter a myth and the wisdom it contains into a fictional advertising narrative for a specific goal that has nothing to do with the original myth. In the Star Wars example, a purely fictional narrative advertising Apple takes the place of a myth about people who see themselves fighting the same battle between Light and Dark sides and in the Christian case, a fictional narrative advertising Jesus-as-redeemer takes the place of a myth about people who see themselves having to also grow up and leave home and accept the struggles of life if they wish to engage with it as a responsible, autonomous adult. The Genesis myth is a terrific teaching tool as it stands. But no Christian can let something beneficial stand without claiming its benefits as belonging to Christianity. As if so often the case with religious thievery of any and all valuables, it has been subverted, used, and imposed on people by Christianity for Christianity. The absurdity of using the myth to explain a later (supposedly) historical event is actually remarkably and obviously stupid. Few Christians seem to even notice. So it’s ok for you to show disdain, including when it misrepresents, but not for me? I’m pretty sure I could pull out a lot of instances that pretty much any neutral observer would consider ‘disdain’, on your part. I give you a bit of your own medicine and you react in this way. If I did so for all your disdain, we’d be meta-discussing all day, with no time to talk about the stuff that actually matters! Please consider this point carefully: a myth has to stand on its own merit and not be dependent on a particular interpretation, a particular culture, a particular language, a particular religion. I’m not sure I can make sense of this. When I read Genesis 1, do I get to interpret “greater lamp” and “lesser lamp” however I please? If your answer is “no”, then there is some required fixity; what is the nature of that fixity? You can’t read myths this way and still have a myth. So a myth cannot possibly function as a myth and also be true? If you hold this position that is curious, because it would appear that the medievals were able to do both. You have broken with this ‘both’; I’d like to know why. Do note that I have passing familiarity with structuralism and post-structuralism. Furthermore, James Hillman in Healing Fiction talks about the need for ‘fuzziness’ in how we think about our future, which might match up with how you describe symbolism in myth. This fuzziness is not the same, however, as “pour whatever meaning you feel like into the words”. “The”? You seriously went there. Have you ever read Augustine on Genesis? If someone attempted to interpret the myth of Star Wars by means of, say, Steve Jobs and why Apple products are necessary for happiness, we would soon find the myth hopelessly muddled by an interpretation reliant on meanings unrelated to the myth itself but IMPORTED to it. So we are banned from ever having myth be anything other than fuzziness? I’m having a hard time understanding you, here. From what you said before, it seems like you were saying that one person could interpret the Star Wars myth one way, another person could interpret it another way, and yet everyone’s interpretation would be similar enough to say that they’re all using Star Wars instead of, say, The Matrix. Or perhaps you are objecting to those who tell you that you must interpret Star Wars as being about Apple, when you would prefer it to be about Microsoft, in your own mind? The Genesis myth is a terrific teaching tool as it stands. But what does it actually teach? You said it cannot depend on several particular things: interpretation, culture, language, religion. What is left, other than, say, math? 1) I never suggested that I was allowed to show or hold disdain but you were not. But you know that. 2) I am not reacting ‘this way’ to show disdain; I am explaining the incredible stupidity necessary to interpret a myth using a later (supposedly) historical event and thinking that’s a method that reveals the myth’s theme. 3) You seem to have difficulty grasping #2. No surprise there. 6) I never suggested anyone or anything to be “banned” (what’s with you assuming I support banning stuff? Not once have I ever suggested any such thing, and you know this but you seem to insist otherwise based on… your need to vilify me and so you create fictions contrary to reality. Get over yourself already. 7) I never talked about ‘fuzziness’. This is a meander wholly of your own making. Leave me out of it. 8) Interpreting myth is a personal undertaking that both informs and teaches one about one’s self. Only myth does this as part of its literary form… otherwise it’s just a story (not knocking stories, of course, but there is something required to make a myth different from just a story. That ‘something’ is the way myths are presented using symbols that are subject to the listener’s (or reader’s) interpretation. You know you have a myth when it fits a certain style – a vague place, a vague time, a test, supernatural encounters, and so on – and all depending on granting granting meaning to the symbols to make sense both in the story AND in your own life. This ‘right’ answer will be generally similar even if the specific meanings are different. 9) What does it teach? Go read it without any Christian baggage and figure that out for yourself. After all, people had been doing that for more than a millennium before the first Christian showed up to claim the myth as property belonging to Christianity. 10) I never said a myth cannot depend of interpretation; after all, the symbols HAVE TO BE interpreted to be meaningful. That’s how each of us shapes the myth to be a personal journey of discovery about ourselves. That you can’t even grasp that central feature but suggest perhaps we only have math reveals the utter contempt you hold for me and my efforts to explain. And that’s why responding to you is usually something I always regret because it’s not just pointless but wastes my time… yet I am foolish enough to keep doing the same thing – responding to you – and hoping for a different result! This comment is not different. 1–3) No, I’m talking about disdain in general: has it ever done something other than make you feel better, at least in our interactions? To me it seems like attempted emotional manipulation, which would seem utterly antithetical to what is required to rationally truth-seek. And thus, all I can rationally do is see your expressions of disdain as bugs in your operating system. But perhaps you can tell me how they have helped you truth-seek—preferably based on evidence, instead of a priori reasoning? 4,7–8) Yeah you’ve given me no indication of what “reveal yourself to yourself” actually means. Maybe you understand it quite well, but so far it’s just as fuzzy as Christianese when spoken by those who might have have a clue as to what they’re talking about. Send in Socrates and: ka-BOOM! So far, the closest I can come is that myth is like a system of equations with at least one free variable that will be chosen/computed/whatever, possibly differently by each person. Is that anywhere close to what you mean? 5) How you differentiate “need for a redeemer” and “need for someone to save me [from various things]”? Let’s build toward said ludicrous, finding when the steps move from non-ludicrous to ludicrous. Surely it is possible for a person to so screw things up, that he/she requires outside help to fix things? Could even a group of people screw things up in this way? As to submission, surely you yourself submit to reality? Or perhaps: reality runs you like a puppet. So what actually would be ludicrous, is the Christian’s proclamation of freedom, not submission! 6) The speak of “banning” is not meant to be a reference to book-burning, but to something being so irrational or otherwise unacceptable that to be associated with it is to be an object of shame/disdain. You’ve clearly shown willingness to show excessive amounts of disdain. If you aren’t aware of how the logical conclusion of this treatment is “banning”, then you might want to stop and think about that. I have In Defense of Shame: The Faces of an Emotion checked out from the library (same authors wrote James Moore’s The Post-Darwinian Controversies); perhaps I’ll know more about precisely what you’re doing after reading it. Having received much disdain in life, including a not-insignificant amount from internet atheists, I do actually have a few clues as to how it works. More understanding, of course, is always better. 9) You seem to think it’s possible even to understand written or spoken language without (a) interpretation, (b) culture. When Tolkien developed the Elvish language, he discovered that he needed a history, geography, and creation myths for it to be a real language. So I really don’t know what you mean when you exclude (a) and (b), and maybe not even (c) language. Some sociologists (they’re scientists, FYI) I’ve been reading have described language as capturing very important bits about culture. Tons of philosophy these days is done on language. And yet you wave all this away, as if one can just plow forward. Can one? Perhaps you could at least give me some examples of what Genesis 1–whatever teaches you? Maybe I can reason from the particulars to the universals. How does the above reconcile with the below? tildeb: Please consider this point carefully: a myth has to stand on its own merit and not be dependent on a particular interpretation, a particular culture, a particular language, a particular religion. That you can’t even grasp that central feature but suggest perhaps we only have math reveals the utter contempt you hold for me and my efforts to explain. Actually, I hold math in very high regard, so it is your contempt for math which is holding you in contempt right now. What I want to know from you is whether there’s stuff going on here which you don’t think can be captured by mathematical formulae and such. One way to get at this is the primary/secondary quality distinction, another is qualia. In comparison, that which science can discover pretty much can be encoded in math. And so, one way to see what I was asking, was for you to distinguish between the stuff science can analyze and what it cannot—at least with given progress. Maybe if you didn’t disdain me so much, you’d see that I’m not doing the same back to you. I find our conversations quite interesting at times, and am willing to plow through when they are boring, because people unwilling to continue when it gets boring usually discover nothing new about the world and are thus mere dilettantes. Sorry, lab. I can’t help you. I really can’t. You either don’t understand what you read in my comments (and never seem to find this a problem) or you purposefully won’t in spite of my best efforts to remedy this chronic misunderstanding. If you had changed your highly negative beliefs about me one in a while (and the distorted meanings you continue to foist on me) I might think it possible and perhaps even worthwhile. But, like with Crude, you rely on your misrepresentations for your commentary and refuse to change them no matter what I say and do, no matter what’s true, fair, or accurate. I’ve criticized you for using this tactic because you constantly demonstrate a willingness to not just misunderstand anything I write but to misrepresent what I have written. This holds true for your responses to my repeated clarifications and explanations. I’ve criticized you time and again for maintaining these misrepresentations even after I successfully challenge them and demonstrate them to be factually wrong. You still continue to maintain them… and insert them in various comment threads on different sites. This tactic you use is not just disingenuous but very hostile and intentionally so. Even that effort I make to clarify and explain what I mean yields no benefit to me; instead, my ongoing efforts simply become a waste of my time and clarifying my points for you time and again to amount to no consequence. I realize now you’re not going to change your incorrect assumptions one jot or tittle. You’re going to continue using them. Mutual understanding does not serve your motives and does not factor into your commentary. If it did, you would. And you don’t. I also willing to believe you simply can’t help yourself. Because of a preexisting condition, your brain and my words will never mesh in any useful or productive sharing of meaning. In spite of my best efforts, you seek neither an honest understanding from my words nor any desire to achieve any mutual understanding. If you did, you’d change tactics because the ones you are using obviously aren’t working. I’ve tried many different ways… all to the same effect: none. But you don’t seem to care about that ongoing failure at all because I suspect it has nothing to do with your motivation for your commentary. I think you’re trying to appear learned and educated and erudite for some other audience than me in your responses to my comments without the substance of them addressing my commentary and criticisms in any honest and meaningful way. Again, this inability to comprehend is a tactic you use to introduce all kinds of quotations that at best are tangential to and certainly diversionary from my commentary and criticism. Using this tactic repeatedly demonstrates a motivation by you quite different from my own. In other words, it seems evident to me that your commentary is designed entirely for show and not for relevant substance to further any understanding of the OP and the criticism/commentary I have raised. I’m disappointed I can not make it worth your while to overcome these imposed and insurmountable problems in our exchanges. Hence, I cannot not help you achieve the goal I think is worth pursuing – mutual understanding – with any additional commentary directed to you. It is fascinating that I see you refusing to alter your horrible misrepresentations of me. This makes me suspect that we both do a lot of talking back to each other. I’ve experienced that before. However, I suspect that you think you understand me just dandily—is this correct, or incorrect? At least answer this, please. If you would like, you could actually list the things I’ve repeatedly gotten wrong about you. As it is, you’ve merely vaguely waved in that direction. That isn’t helpful. As to the “this will never change”, all I can say is that I’ve had successful conversations with hundreds if not thousands of different atheists on the internet, over the the past 15+ years. Yep, once in a while I do hit an impasse. Given that data, what conclusion would you draw? This makes me suspect that we both do a lot of talking back to each other. This makes me suspect that we both do a lot of talking past to each other.